Swinging his way from the jungles of Africa, this rambunctious, award-winning primate (Chosen specifically by Toy Directory for the very prestigious Top Toy Award for 2007) is sure to hang around your child and become his or her best friend. Not only is Mashaka an adorable monkey, but also a comfy pillow and super-soft blanket all in one. Perfect for road excursions or just cuddling in bed. Mashaka also makes a perfect baby shower gift. Available while supplies last. Washing - Blanket: Machine wash, tumble dry. Outer pouch: spot wash (if machine washed, using a lingerie bag is recommended). Blanket zips off/on for easy washing. Two bottom hook-and-loop Velcro tabs gather Zoobie into animal shape. Recommended for ages 3 and up, but safely tested for all ages. Swinging his way from the jungles of Africa, this rambunctious, award-winning primate (Chosen specifically by Toy Directory for the very prestigious Top Toy Award for 2007) is sure to hang around your child and become his or her best friend. 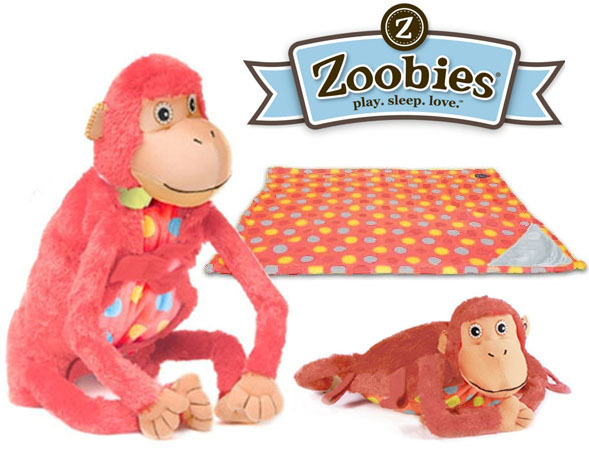 Not only is Mashaka an adorable monkey, but also a comfy pillow and super-soft blanket all in one. Perfect for road excursions or just cuddling in bed. Mashaka also makes a perfect baby shower gift. Available while supplies last. Microbead stuffed head for ultimate squishibility. Large, super-soft coral fleece blanket inside: 23"x29" 17"L 100% polyester.